Since 1896, Volunteers of America has been ensuring hungry men, women and children are not forgotten during the holidays. 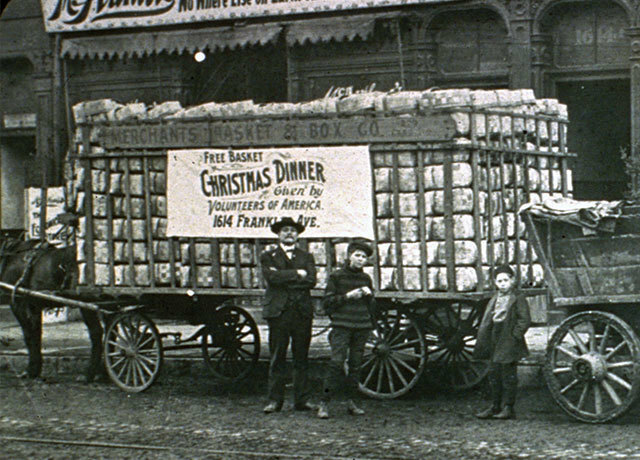 Originally, Volunteers of America co-founder Maud Booth would load up wagons with baskets brimming with all the traditional holiday food - turkey, potatoes, stuffing, relish, peas, pie, and milk for the children. She and her wealthy friends and hundreds of volunteers would deliver thousands of baskets to the poor. The families and individuals who receive food vouchers include the elderly, veterans on limited incomes, and homeless families residing in our shelters. The number of food vouchers we distribute is solely based on the amount of private money we raise. These food vouchers act as cash in supermarkets and allow recipients to shop for food that is special to them rather than have to rely on a food pantry or soup kitchen for their holiday meal. Every $25 donation pays for one food voucher.